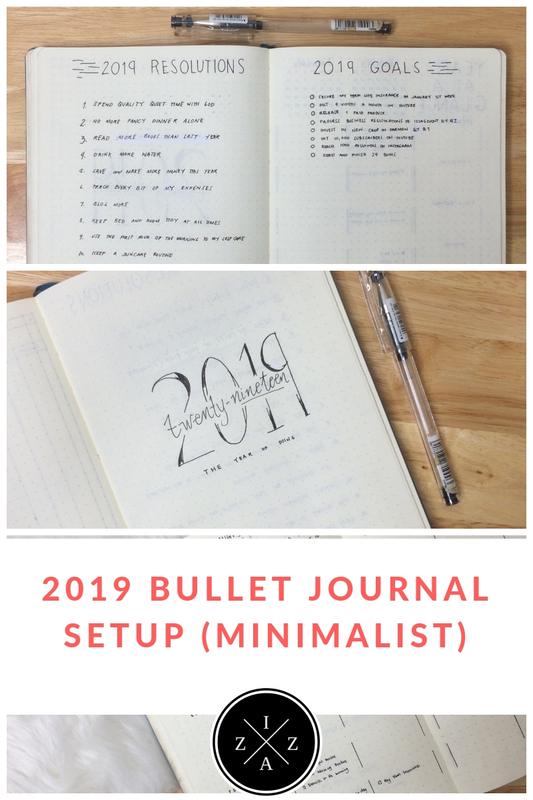 Today I will be sharing my 2019 Bullet Journal Set Up. Last year, the main planner I was using was the BDJ PowerPlanner gifted to me by my cousin. I tried my best to use the planner but it just didn't fit how I plan. Don't get me wrong, the BDJ Power Planner is a great planner it just wasn't the right planner for me. 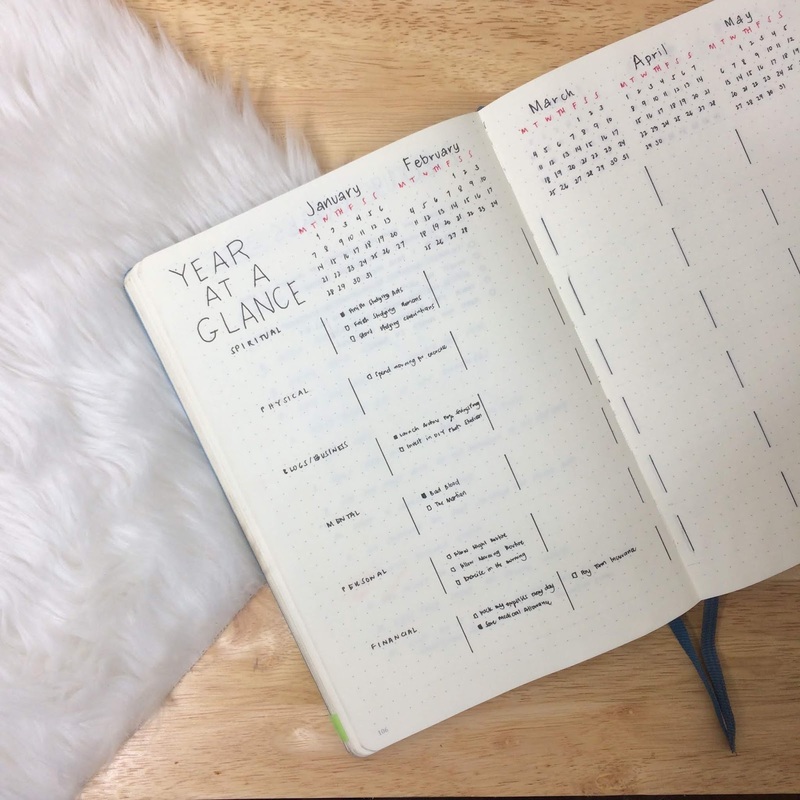 From someone who have been into bullet journaling for years, it was a hard transition. I had a ton of empty pages because I don't what to write. The calendar page is too small to plan/to write on and there are just too many boxes in the weekly/daily spreads. Anyway, still a big thank you my cousin for giving the said gift for my birthday last 2017. Okay, now back to my 2019 Bullet Journal Setup. Like last year, I kept this year's set up simple and minimal. Reading Ryder Carroll's The Bullet Journal Method gave me so much wise insight on how to best implement the system in my life. I barely used my simple and minimalist Bullet Journal for 2018 so I thought it's just fitting to use the notebook again for my new Bullet Journal. Thankfully, I still have almost 150 pages left. I have a bullet journal for yearly planning. Another dedicated planner for blog and business. And a Belle De Jour Planner for daily planning and creative journaling. I am just down to two notebooks. This bullet journal where I will use from yearly, monthly and daily planning. And a Stradmore A5 notebook for blog and business. I will be blogging the blog and business bullet journal soon. 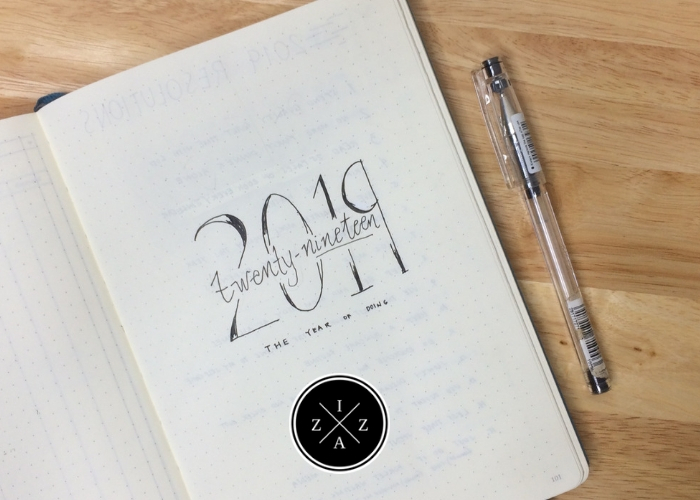 For now, let's focus with the 2019 Bullet Journal Set Up. Even though I am using an old notebook I still wanted to create a cover page for my planner. I created a simple indication of the year 2019 and put the words "The Year of Doing". This line really stick to me when I was pondering what I want for 2019 to be. Instead of a Word of the Year I settled with something that will remind me of what my intention is for the year to come. I felt like last year was all about delays and regrets. I wasn't performing at my best especially in my habits and routines. I had a lot of missing ina ction moments in the blog, I skipped weeks without a new post because although I have systems in place, I lack the will to do. That's what I'm working on come 2019. I want this year to be the year of doing. Instead of stressing myself to find the perfect system to write a blog post, I will simply write a blog post. Instead of researching ways on how to wake up early and have morning routine, I will wake up early and have a morning routine. Just do it! No ifs and buts. Something I didn't do last year was create a page for resolutions. I define resolutions as things you want to change in yourself. Goals, on the other hand, are things you want to achieve. The basis of resolutions is what happened last year why goal's basis is what you want to happen in the future (a year from now, 3 years, 5 years or 10 years). There's even a bucket list for a lifetime. Because I wasn't happy the way I handled my time, my money and my resources last year, I knew I wanted to ponder upon what I could change for 2019. Thus, I created a page for my resolutions. Every now and then I go back to this page and assess if I've been performing in the way I wanted to perform. I check every number and assess what good thing I've done to resolve that area. Did I spend quality time with God? Did I drink more water today? etc. The goals page is still unfinished and I've only written the major specific things I want to achieve. I used to create a Yearly Calendar for my Bullet Journal which holds all the birthdays and special dates for the year. But for 2019 I wanted to maximize the yearly calendar to also hold my intentions or big goals for the said month. I am constantly working on improving different areas of my life namely - spiritual, physical, career (blog and work), mental, personal and financial. Here’s one of the most important page on my BuJo set up this New Year. Inspired by Passion Planner’s Road Map page, I created my own “This year’s game changer”. Your Game Changer is the goal that would have the most positive impact on your life right now (for me, this year). You simply write that goal in the center and in five minutes map out everything you need to do to accomplish that goal. Totally in love with the idea. Same as last year, I added one full spread to document the routines I want to adapt in my life. I created this to ensure that I stay reminded on what I should be doing on what time. These pages serve as guide for me. Morning Routine – This part holds the activities I should be doing upon waking up on a work day. Evening Routine – This part holds the activities I should be doing as soon as I get home. Sunday GYST - This part holds my Sunday Routine although I have yet to fill out what I wanted to include. GYST refers to Get Your Stuff Together, created to set the week ahead. Planning Routine - This part holds what I do on a monthly, weekly and daily in terms of planning and my Bullet Journal. 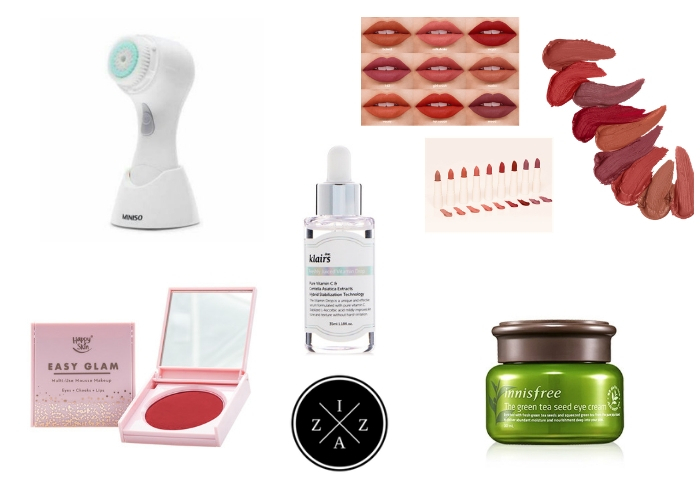 Skincare or Beauty Routine - This part holds my skincare schedule, what I want to do every month, every week, every other day and every single day. Cleaning Routine - This part holds how I will be keeping a tidy room throughout the year. Last for my yearly page is the Reading Log for 2019. I kept a simple page to keep track of the books I'm done reading. So far, I am on my third book for 2019! And I'm really happy that I am on track of the reading habit. For this year I challenged myself to finish 30 books. This is a bit bigger number compared to last year's 25 but with the current phase I have I think I can manage. 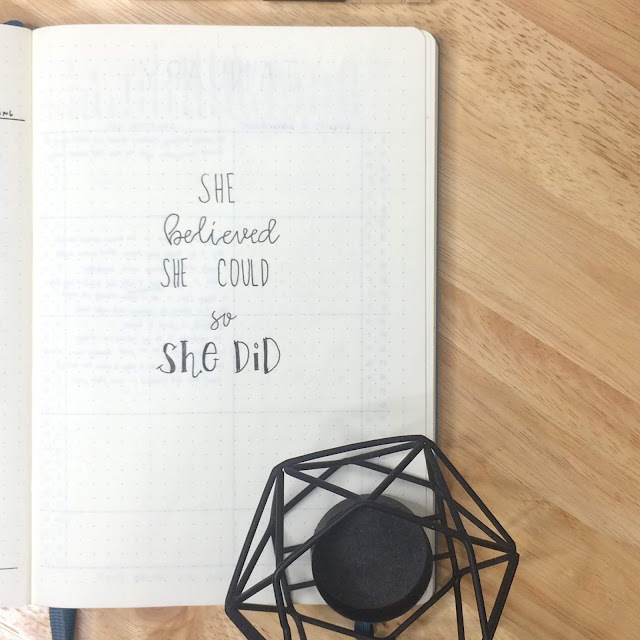 The last page before my monthly and weekly pages is a simple life verse which I think relates to the line I wrote in the cover page, "She believed she could so she did". That’s it for my simple and minimalist bullet journal for 2019. 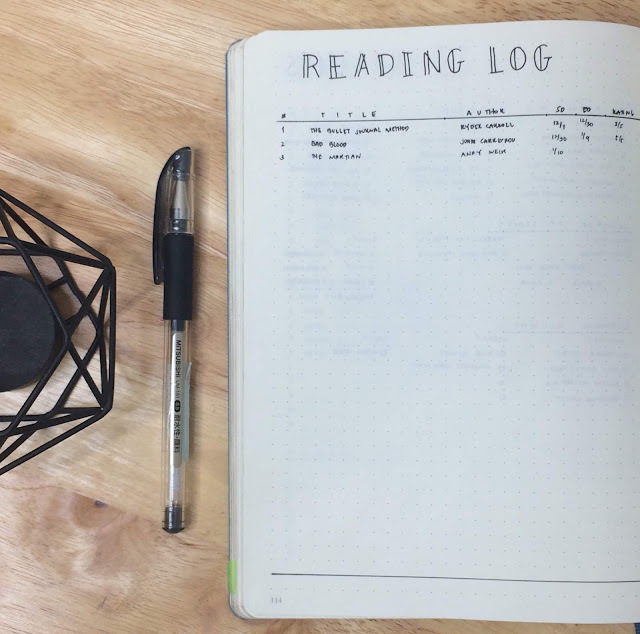 What do you think of my 2019 bullet journal set up?